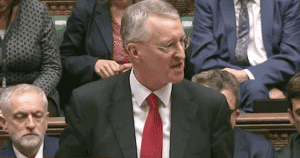 HILARY BENN has compared ISIS to General Franco’s fascists during an impassioned House Of Commons Speech on Syria. The shadow foreign secretary’s address earned applause from both sides of the House Of Commons as Britain’s MPs voted to go to war in Syria. Benn, the son of Labour legend Tony Benn, had defied his party leader Jeremy Corbyn to vote for the bombing campaign. Benn said: “We are here faced by fascists. Not just their calculated brutality, but their belief that they are superior to every single one of us in this chamber tonight, and all of the people that we represent. They hold us in contempt. 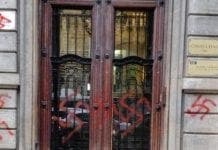 “And what we know about fascists is that they need to be defeated. And it is why, as we have heard tonight, socialists and trade unionists and others joined the International Brigade in the 1930s to fight against Franco. It’s why this entire House stood up against Hitler and Mussolini. It is why our party has always stood up against the denial of human rights and for justice. The RAF carried out its first sorties over Syria hours after the House of Commons vote, which saw 397 MPs in favour of military action and 223 against. His father will be turning in his grave. When the British ground forces inevitably march in, this guy should be leading them. In fact ALL those brave, gung-ho warriors who voted to drop bombs on civilians, ought to be in their ranks instead of sitting on their fat backsides, pontificating on the desirability of war (for other people). I have nothing to add. Well said, Stefanjo. British losses may easily be avoided if UN secretary General Ban Ki-Moon would be encouraged to fly to Pyeongyang and ask for North Korean UN ground troops. The only asset that North Korea owns in abundance is soldiers. In return for their let, North Korea has to receive financial benefits in order to reform their economy to Vietnamese role model, as North Korean baby dictator Kim Jong-Un had already claimed at his New Years Address in 2013. Russia and China will not block North Korean UN troops by their votes at the UN Security Council. A war against IS will only be legitimate under UN Security Council approval. North Korea is not an ally of any of the warring parties in Syria and Iraq. On November 16th Chinese news agency Xinhua and South Korean news agency Yonhap announced, that Ban will fly on November 23d for a 4 days visit to North Korea. Also BBC confirmed this journey. But two days later, Ban denied having plans for a trip to North Korea. Why? After Iran and Cuba, with North Korea Obama missed the chance to dispose another foreign policy burden. Why do we afford a UN Secretary General from South Korea doing absolutely nothing besides always expressing ‘to be worried’? On November 17th, Park Geun-Hye, President of South Korea surprisingly had offered financial aid to North Korea if they freeze their nuclear program. On November 3d, a meeting took place at Seoul with Park Geun-Hye, Japan’s prime minister Abe and Chinese prime minister Lee Keqiang. What else than North Korea could be on the agenda? On October 29th, when Angela Merkel visited China, Chinese president Xi promised that China wants to play a greater part in the Syrian conflict. What does all that mean? I think that your imaginative hypothesis is very clever, but in my opinion to send no muslims soldiers, against ISIS could be seen by many muslims as a new crusade. That is a big mistake. When a politician speak about great ideals, it´s very clever to put your hand over your wallet. 1º) Three years ago , the issue submitted to deliberation was to bombing to Assad regime. And now is to bombing the enemies of Assad. 2º) The bombing is made in Syrian territory, without request of the Syrian government, and without necessity because Russia is making it much better. 3º) No reference to the oil that the DAESH is smuggling. 4º) No references to the allies and sponsors of the DAESH. 5º) No reference to the suppliers of weapons of the DAESH. 6º) An emotive reference to the fight against the fascism in WWII, forgetting that the rise of the fascism in Italy and Germany and the Franquist regime in Spain would have been impossible without the hide support of UK. And showing that Mr. Been didn´t know the “Plan Unthinkable”; the attack against the Soviet Union , by the combined forces of UK, France and… the Nazi Germany in 1944. 7º) An emotive reference to the defence of human rights made for UK in WWII. This reference would be more convincing if would not have been colonies in India, Sudafrica , etc. And if ,25 years after, the people of Diego Garcia Island would not had been expulsed , of his island with the pretext of be to illegal inmigrants. Equally I was wrong about the “Plan Unthinkable”; because i had not included the US army in the alliance against the Soviet Union. English humour is a foreign country to you, isn’t it Anselmo? Anselmo, I don’t think that North Korean ground troops may be seen by muslims as a new crusade, because almost none of the North Koreans are Christians but only belive in their “Great Leader” and eternal president Kim Il-Sung. Also most muslims do not accept that IS followers are muslims, as can be demonstrated by the hundreds of thousands of Syrian refugees that had fled to Germany this year. Experts say that more than 1,200 different parties are involved in the Syrian war. Therefor only a power which is not connected to any of these parties and which is authorised by the UN Security Council will have the authority to force a ceasefire in Syria and to destroy IS in Syria and Iraq.